The 10 Days Uganda Gorilla Safari Uganda Wildlife Safari is a comprehensive safari package that enables you to explore among the Uganda’s best destinations that are filled with counts of wild game and mountain gorillas. The 10 Days Safari takes you through the Murchison Falls National Park in the north west of Uganda with its world’s powerful Murchison Falls and from there it links you to Primate Capital of the World- Kibale National Park blessed with an enormous counts of habituated chimpanzees, the Bwindi Impenetrable National Park which has almost a half of the world’s critically endangered mountain gorillas and the scenic Lake Bunyonyi dubbed the lake of a thousand islands. The safari will allow you enjoy the various tourists’ activities like Mountain gorilla trekking, Chimpanzee trekking, boat riding, nature walks, wild game viewing, and cultural tours among other activities. Day 2 of the 10 Days Uganda Gorilla Safari Uganda Wildlife Safari: Transfer from Kampala to Murchison Falls National Park & enroute stopover at Ziwa Rhino Sanctuary. Day 3 of the 10 Days Uganda Gorilla Safari Uganda Wildlife Safari: Early Morning Game drive & Afternoon Boat Cruise, Hike to the fall. Day 8 of the 10 Days Uganda Gorilla Safari Uganda Wildlife Safari: Transfer from Queen Elizabeth National Park to Bwindi with an en-route game drive in the Ishasha sector. Day 9 of the 10 Days Uganda Gorilla Safari Uganda Wildlife Safari: Do gorilla trekking & an evening Cultural walk to the Batwa Communities. Immediately you arrive at Entebbe international Airport –Uganda’s main entry point, you will be warmly welcomed by one of our company driver guide who will transfer you to Kampala at a hotel of your choice for dinner and overnight. On arrival to the lodge, the driver guide will give you a chivalrous introduction about the safari and Uganda in general. After an early morning breakfast, depart Kampala early morning taking a scenic drive north-west through the most popular Luwero Triangle. The overland journey of 311kms about 5 hours’ drive will take you through the flat landscapes of Nakasongora with savannah vegetation dotted with long horned Ankole cows .Have stopover to trek the Rhinos at Ziwa Rhino Sanctuary. The Rhino trek may take you 1-2 hours and you will get a unique opportunity of encountering the only white Rhinos protected in Uganda. Have a thrilling Lunch at Kabalega dinner and thereafter proceed with the drive to Murchison Falls National park for relaxation, dinner and overnight. Following an early morning cup of coffee, embark on an early morning game drive in the well-organized driving tracks of the delta area, Buligi tracks, Albert and Queen Tracks to search for giraffes, lions, hart beasts, elephants, cape buffalo, waterbucks and many other mammals. You may also encounter different bird species like the Black Chested Snake Eagle, Blue Napped Mouse birds, the Secretary bird, Swallow Tailed Bee-eaters and the Silver Headed Agama. After 3-4 hour game drive, retire back to the lodge for relaxation and lunch. After lunch, drive to Paraa peninsular to enjoy a boat ride on the placid Victoria Nile to the foot of the magnificent Murchison Falls where the Nile plunges through a narrow crevice. The boat cruise will reward you with the views of the wild game such as Hippos, Nile Crocodiles, when they are drinking on the river side. Disembark from the boat cruise and embark on 45minutes hike through narrow path to the top of the world’s most powerful falls. 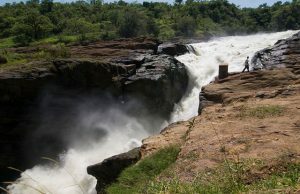 Upon reaching the top, you will enjoy the roaring sounds of the Nile as it crumbles its head on the impermeable rocks that have narrowed its way to less than 8m for centuries past. Thereafter, retire back to lodge for dinner and overnight stay. Take a relaxed breakfast and thereafter start a scenic drive of 441 kms along the Albertine escarpment with prominent sceneries of the rift valley to Kibale .You will advance through Bulisa which is in the oil region of Uganda and have stopover for lunch in Hoima town. Thereafter, proceed with the drive through the rolling scenic landscape of south western Uganda through Fort portal town Kibale forest national park. Upon your arrival at the park, connect to your pre-booked lodge to check-in, have dinner and overnight. Accommodation: Kyaninga Lodge (Luxury/upmarket), Chimpanzee forest Guest House (Mid-Range/Standard), Rwenzori View Guesthouse (Budget/Basic). 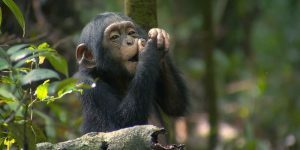 This is a day of life time experience, Chimpanzee trekking in the primate capital of the world-Kibale forest national park. Early morning after breakfast, report to the park headquarters at Kanyanchu tourism Centre for an early morning briefing about the etiquettes of chimpanzee trekking in Kibale national park .After briefing, an experienced UWA Ranger guide will lead you into the forest trail to trek the Chimpanzees and along the way, the trek will expose you to stunning flora as well as other primate species such as black & white colobus monkey ,Red-tailed and blue monkeys, grey-cheeked mangabey, olive baboon, bush baby and potto. After 2-5 hours of trek, you may come up-close to the chimpanzees and you will be allocated one hour to stay with these human brothers. The Chimpanzees will seduce you in a state of stupefaction as they swing through the branches, make pant hooting calls, play with each other, and imitate your body language along with other features that will make your one full hour with them a life time experience of its own. Disembark from the activity to your lodge for relaxation and lunch. After lunch, transfer to Bigodi Wetland Sanctuary for an afternoon tour. The Bigodi wetland walk will expose you to typical eco –tourism encounter in Uganda. The impressive flora and fauna existing along with the local community is indeed rewarding to encounter. The sights of great blue turaco and the Sitatunga may not be missed. Retreat from the activity back to the lodge for relaxation, dinner and overnight. 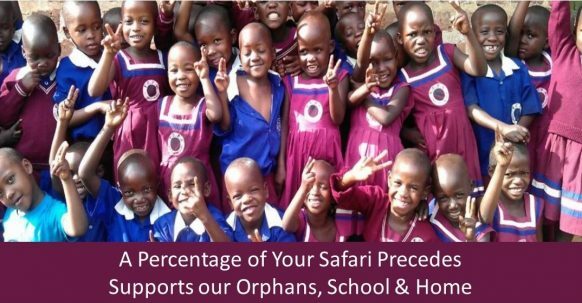 On this particular day, you will take an early morning breakfast and there after embark on an early morning game drive at 6:30am in the rolling savannah plains of Queen Elizabeth National Park. The park’s diverse ecosystem of grassy plains, tropical forest, rivers, swamps, lakes and volcanic craters is home to an incredible abundance of wildlife. Look out for buffaloes, lions, elephants and other wild life in their natural habitat. After 3 -4 hour game drive covering about 200 kilometers, you will retire back to your lodge for relaxation, memory sharing and lunch. Thereafter, embark on an interesting afternoon chimpanzee trekking in the Kyambura gorge that starts from 2:00pm .The Kyambura Gorge experience is more than exploring chimpanzees in their natural environment, the activity stretches an extra mile to teach you about the ecosystems of Kyambura Gorge’s atmospheric “underground” rainforest, including vegetation types; bird identification and behavior; and chimp and monkey ecology. 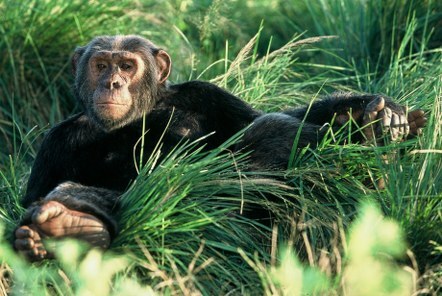 While at the site, you stand a pretty good chance of hearing and seeing our distant cousins-Chimpanzees as they are habituated. The activity which lasts between 2-3 hours is very rewarding and after the activity, you will retire to your lodge for dinner and overnight. Thereafter, embark on the interesting drive to Bwindi Impenetrable National Park. The drive will take you through the most popular Ishasha sector where you will have a chance of meeting the tree climbing lions that tend to lie on the branches of fig trees and also have stopover for Lunch. Afterwards, continue with the drive to Bwindi Impenetrable National Park arriving in the evening for relaxation, dinner and overnight. 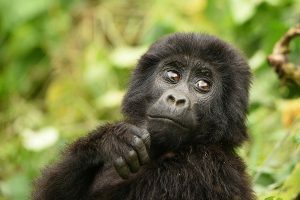 After an early morning breakfast, you will proceed to the Park headquarters for registration and join other trekkers in an early morning briefing about the etiquettes of Gorilla Trekking in Bwindi Impenetrable National Park. As soon as the briefing is done, you will enter the jungle to trek through thick creepers and undergrowth with your guides to find the Gorillas. The trek may take you between 2-8 hours to encounter the Mountain gorillas and this will mainly depend on the movement of the apes. The steeply forested landscape is incredibly dense but crisscrossed by numerous animal trails allowing access to tourists. Once up-close to the apes, you will be given one magical hour to View and interact with these stunning apes plus taking photographs. Retire back to the starting point after the one hour and proceed to your lodge for a late lunch and relaxation. After relaxation, you will be driven to the nearby Batwa community for memorable, refreshing cultural encounter. Here you will be guided by a local guide who will take you to the different communities to see how people have managed to survive through farming. You will see how local brew is processed from fresh Bananas and forest remedies to get beer and Waragi and also enjoy the performances done by the local Batwa women groups. After that interesting cultural encounter, you will drive back to your respective lodge for dinner and overnight.